George had a con to fit everyone. His wife and even his mother were not exempt from his shady dealings. He conned them all. He posed as many different men, using disguises to help him through the tight spots. He was everything ranging from a rabbi to a stockbroker; from a genuine hobo during the Depression, to a Nazi informant during WWII. In the end, he triumphed with a successful diamond business in San Francisco and was held in high regard by his peers. None of them ever knew any of the many secrets of his past lives living against the law, that is, until now. 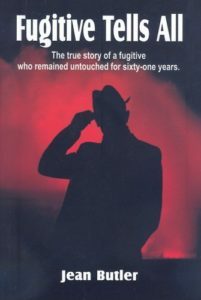 Fugitive Tells All is his written confession told by him to Jean Butler, his greatest confidant, during the last years of his life. He felt the truth should be told, and he bared his soul so that he could, at last, find salvation. This incredible and highly-anticipated novel will always be remembered for its true and unforgettable character.